The use of CRISPR/Cas9 to edit the eukaryotic genome is having a dramatic impact on virtually every field of biotechnology, from crop science to tumor biology (1). The two key features that set this genome modification system apart from other genomic tools are its efficiency and specificity. However, recent articles have raised some doubts about its specificity, leading to speculations regarding its future use in sensitive applications such as gene therapy and drug development. 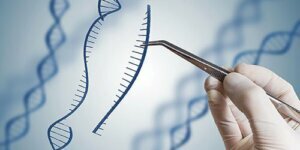 Since the adoption of CRISPR/Cas9, questions have been raised about the introduction of unwanted mutations during the procedure of genome editing (2). The most studied secondary mutational events are known as off-target mutations (OTs). OTs are introduced in non-random genomic locations when the Cas9 protein is recruited on DNA sequences similar to the target site (e.g., sequences that share enough identity with the target site to interact with low affinity with the guide RNA portion of the CRISPR/Cas9 complex). The main characteristics of OTs are that they share at least some level of sequence identity with the target site and are, therefore, predictable, and that they happen with very low frequency since they rely on low-affinity binding with the CRISPR/Cas9 complex to the DNA (3, 4). Two recent articles describing the introduction of unwanted mutations in CRISPR/Cas9 genome edited human cells have raised a lot of interest and spurred intense debate about the safety of this technology (5,6). In these publications, a group from the Karolinska Institute in Sweden and one from the company Novartis reported that, in non-transformed human cells, the CRISPR/Cas9-mediated modification of the target site happens preferentially in cells that have a defective p53 pathway. By selecting cells where the genome editing procedure has been successful, researchers, therefore, enriched the culture with cells carrying potentially tumorigenic mutations. If any of the mutated cells is used for therapeutic purposes, it could result in an increased risk of cancer for the patient. These data caught the scientific community off-guard since, as opposed to OTs, these mutations happen frequently and share no similarity to the target sequence. The explanation proposed by both research groups is that the mutations in the p53 pathway induced by CRISPR/Cas9 are not OTs but genomic modifications linked to the molecular mode of action of the double strand DNA repair mechanism triggered by the activity of CRISPR/Cas9. To modify a specific locus, the CRISPR/Cas9 complex creates a double strand break that is used as an entry point to introduce the desired mutation (7). Non-transformed cells react to this damage by triggering the DNA damage response which, in turn, lead to cell cycle arrest and, if the breaks are not repaired, to apoptosis. For this reason, gene editing often results in cell toxicity and its efficiency in non-transformed cells is usually low. On the other hand, if a cell undergoing the CRISPR/Cas9-mediated gene editing procedure happens to have an inactivating mutation in one of the elements of the DNA damage warning system, it might escape the toxicity induced by the cleavage of the target DNA and acquire a selective advantage over WT cells. After a few cell divisions, most of the CRISPR/Cas9-modified cells will be derived by this single mutant cell and will, therefore, carry the additional mutation. Enrichment of tumor-prone cells in CRISPR/Cas9 genome editing procedures has, therefore, become now a major worry both for researchers and for clinical scientists who are starting to question the utility of the technology altogether. Heteroduplex analysis. OTs are usually short deletions introduced by the non-homologous end joining DNA repair mechanism in sequences sharing a high level of identity with the target site. Due to their nature, OTs are reliably identified by an approach usually referred to as heteroduplex analysis. This PCR-based technique is fast and efficient and is one of the best options for the analysis of short genomic fragments with a known sequence. On the other hand, heteroduplex analysis is not suitable for the unbiased screening that might be required to validate the safety of a CRISPR/Cas9 modified cell line, and sequencing might be the best alternative. Sequencing. The most direct approach to exclude the presence of harmful secondary mutations is sequencing either part or the entire genome of the cells that have undergone CRISPR/Cas9-mediated genomic editing. If a sequencing approach has been selected, it is crucial to decide whether to proceed with a targeted or a whole sequencing approach. The choice of methodology depends on the nature of the cell population that is analyzed. Targeted sequencing. Amplicon sequencing is one of the preferred approaches to obtain ultra-deep coverage of specific genomic regions. Very high coverage is crucial if the cell population to analyze is heterogeneous. If only a minority of cells are suspected of carrying the unwanted mutation, low sequence coverage might fail to detect detrimental genomic variants. The trade-off of targeted sequencing is that, as for heteroduplex analysis, it will allow the analysis only of a minimal part of the genome and will not exclude the presence of mutations outside of the selected region. However, as described by both the Karolinska and Novartis groups, mutations can occur in unpredictable genomic regions and, therefore, a focused analysis of a few genes might be too limiting. Whole genome sequencing. With the price per sequence falling well below the $1,000 mark, it now makes sense to consider whole genome sequencing (WGS) as a viable option for analyzing the genetic integrity of CRISPR/Cas9-edited cells. WGS is the solution of choice for clonal (e.g., derived from a single CRISPR/Cas9 modified cell) and homogeneous cell populations, where most cells share the same genomic profile. The advantage of WGS is its capacity of detecting mutational events irrespective of their nature and position in the genome. However, the long timelines historically associated with NGS analysis have traditionally reduced the appeal of this approach. The recent integration of automated DNA purification with downstream library preparation and sequencing have contributed to reducing the time of WGS to less than 35 hours from DNA extraction to data analysis (8,9), making it an attractive option for routine analysis of CRISPR/Cas9-modified cells. CRISPR/Cas9 has revolutionized all aspects of applied genomics, paving the way to efficient and specific modification of the eukaryotic genome. Its astonishing success in virtually every field has, however, raised unrealistic expectations in scientists worldwide and, therefore, every potential pitfall of the technology tends to be inflated and used to question the technology. Due to the complexity of DNA biology, it would be unreasonable to expect that a technology could modify the genome without causing any unwanted secondary effects. As with any genomic manipulation, the key to using CRISPR/Cas9 effectively will lie in extensive screening to identify unwanted secondary mutations and remove any cells that might negatively affect the desired result. Wu X, Scott DA, Kriz AJ, Chiu AC, Hsu PD, Dadon DB, Cheng AW, Trevino AE, Konermann S, Chen S, Jaenisch R, Zhang F, and Sharp (2014) Genome-wide binding of the CRISPR endonuclease Cas9 in mammalian cells. Nature Biotechnology 31: 670. Miller NA, Farrow EG, Gibson M, Willig LK, Twist G, Yoo B, Marrs T, Corder S, Krivohlavek L, Walter A, Petrikin JE, Saunders CJ, Thiffault I, Soden SE, Smith LD, Dinwiddie DL, Herd S, Cakici JA, Catreux S, Ruehle M, Kingsmore SF. (2015) A 26-hour system of highly sensitive whole genome sequencing for emergency management of genetic diseases. Genome Med. Sep 30;7(1):100.